The look of Scrooged is cold and overdeliberate — intentionally so, I think. Comedies (and action-comedies) had gotten slicker and chillier and more grandiose during the ’80s; it started, I think, with The Blues Brothers, a musical comedy that boasted more car crashes than any action film to date (or perhaps even a year earlier with Steven Spielberg’s brass-band-on-crank 1941), and took a step further with Ghostbusters. Well, Scrooged represents the ne plus ultra of the big-comedy style — it looks and sounds like Die Hard. Michael Chapman’s icy cinematography casts a gleaming blue pall over everything, and Danny Elfman’s typical robustly morbid score makes the movie feel like a Tim Burton film. The milieu, a network building on Christmas Eve and the teeming confines of the mind of network president Frank Cross (Bill Murray), justifies what Pauline Kael called the movie’s heartless beauty. “Cross (n.): a thing they nail people to,” says a banner in Frank’s office, and Scrooged takes its cue from that black-comic, mildly sacrilegious joke. The script is by Saturday Night Live vets Mitch Glazer and Michael O’Donoghue, and it definitely shows signs of the satirical wit of the latter. (O’Donoghue has the perfect cameo in the film, as a priest whose glasses reflect the inferno of cremation.) Scrooged is the rare film script O’Donoghue had a hand in that was actually produced, and his touch is obvious in the opening gag, a holiday special called The Night the Reindeer Died starring Lee Majors. Hip and knowing as that joke is (for 1988), it can’t help but come off a little dusty now. Network TV has gotten leaps and bounds worse in some ways since 1988 (and better in others), but it’s no longer cheesy in quite the same way that could plausibly give us a Lee Majors Christmas special. Frank’s big holiday production is a broadcast of Scrooge starring Buddy Hackett, and his own journey follows Scrooge’s as he’s visited by three ghosts who point up the ways in which television has coarsened Frank’s soul. 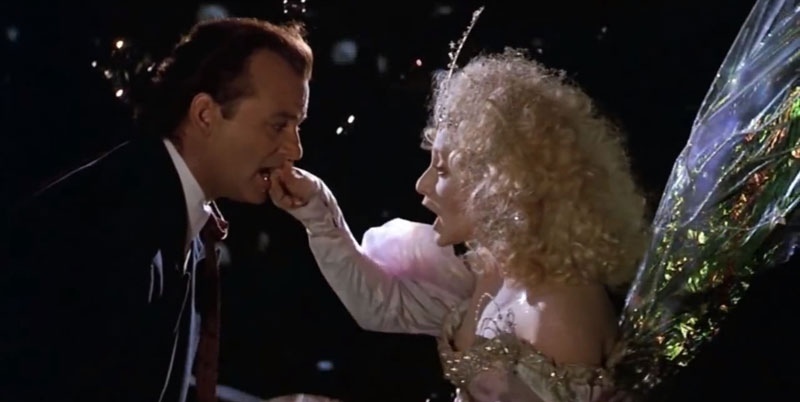 The most memorable ghost, of course, is the Ghost of Christmas Present, played by Carol Kane with her usual crackpot twinkle; Kane as she appears here would have been perfect to play Delirium in an adaptation of Neil Gaiman’s Sandman. This ghost bashes Frank around gaily, including, most famously, with a toaster. These are harsher times and Frank is a harsher Scrooge, so harsher methods are called for. It all leads to Frank unburdening himself on live TV, beseeching the audience to bring the Christmas miracle of kindness into their everyday lives. This is both a parody (the main target, I think, is the eleventh-hour rants Jerry Lewis used to spew during his telethons) and genuine. Frank’s language is hapless, abashed, painfully sincere. Many critics didn’t know how to take it at the time, but viewed now after two decades of progressively melancholic Murray performances, it reads like the start of Murray’s getting away from his “cold yet sweaty” (Kael again) persona towards something warmer, more humane. Murray, it’s clear today, was the perfect Scrooge of the ’80s. He had coasted for years on a certain callous attitude, and he knew it was time for evolution. In a lot of ways, Scrooged is very late-’80s, from the jokes it makes about TV to its rogues’ gallery of comedians (including John Forsythe, a still-young John Glover, and most of Murray’s family). It’s a coruscating pop artifact, and I remember having mixed feelings about it at the time, but these days it brings me right back to the fall of 1988, my first semester at college. Maybe I wasn’t ready for its message of anti-irony then, but now it seems refreshing. It’s also a throwback to a time when serious money and resources could be thrown at a movie like this, a problematic movie that lurches tonally this way and that, but which makes an unembarrassed case for weirdness and humanity.